The threat of being hurt as a minority is real, especially when those in power respond to hate crimes with nothing more than a flimsy, “stop it”. When Trump was elected, all my old fears returned. Like the time my mother picked me up from elementary school in tears. My mother never cried. So when I witnessed her public display of emotion on January 20th, 1991, I felt as if my life was in jeopardy. In the long silence that came before she explained what was wrong, I imagined buildings crumbling around us. And in a way, they had. “People are hurting,” she said. My mother was referring to the civilians being decimated by the first rash of bombs that fell over Iraq during a forty-two day strike. My child-brain immediately understood the danger of being related to those who were so violently struck down by my host country. And in the days that followed, my fears were confirmed when I was told that I may be the target of hatred and violence. The thunderous beginnings of the Gulf War marked the moment when I realized that I was not safe, and that hurt. I was hurt even before anyone uttered a hateful word because my fears led to early-onset anxiety. Instead of worrying about what I was going to wear the next day, I worried about my classmates “finding out” that I was the child of Iraqi immigrants. I was only ten years old. I told no one my dirty secret, living beneath a dark veil of shame and silence. As a light skinned girl, it wasn’t immediately obvious where the olive undertone and frizzy brown hair came from. But it wasn’t long before my classmates found out and before my delicate self-image cracked under the weight of every racist incident. I was called names, kicked, tripped, pushed and laughed at. The humiliation during my 5th grade term was enough to cause daily stomachaches that ensued well into my teens. I hurt inside. So much so, that I learned to hate myself and others over the next twenty years. I struggled with an inferiority complex and developed conflict-phobia that exacerbated my existing Post-Traumatic Stress Disorder. After 9/11, I endured discrimination daily, from being interrogated about my religious affiliation all the way to being told to my face that “we [the U.S.] should kill all of them [Iraqis]”. My self-esteem plummeted and depression took hold, all of which was directly linked to the micro aggressions and full-on hatred of others. 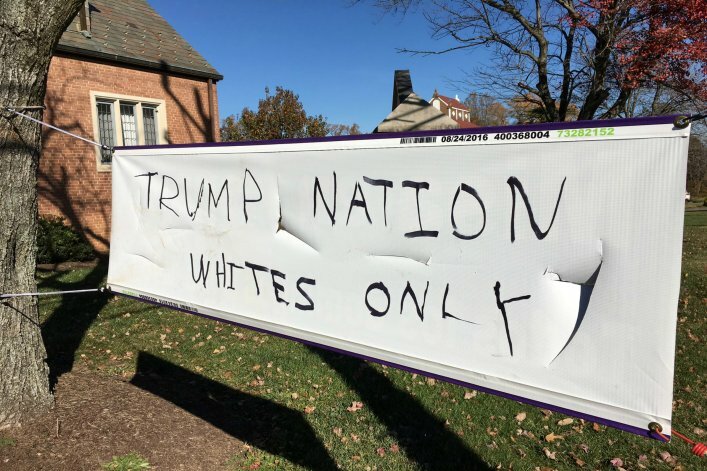 For those who believe minorities are in no real danger in this post-election climate, I implore you to understand this one truth: That being hated hurts. Period. It’s true; my life was never directly put in jeopardy. I never feared the sound of an approaching USAF F-117 Nighthawk the way my relatives living in Baghdad did, but I hurt nonetheless. Because being labeled “the enemy” leads to a multitude of injustices, and injustice hurts. Unfortunately, I am not alone. Every single minority group in America has been labeled the enemy at some point throughout our history, if not continuously. And today, many of the same marginalized communities are under attack by racist and white supremacist Trump supporters. This means that minorities will continue to suffer like I did regardless of whether or not their bodies are physically damaged. More children will grow up feeling less confident because they are bullied for being gay, trans, disabled or for being a girl. People will continue to fear for their own well being and that of their children as the president-elect allows his supporters to harass Black, Asian, Latino, Native, Jewish and Muslim communities. I don’t fear for myself as much as I fear for others who are more vulnerable than I. Like those who are visibly other. And of course, I fear for our children. There is no doubt in my mind, that children today will be bullied more for the parts of them that, by this day and age, should be unequivocally accepted. It is for them that I write this post, so that they know they are not alone. That words of hatred can hurt like sticks and stones. That their lives and stories matter. That yes, their pain is real and that there are many allies out there who are willing to listen to and love them precisely for who they are.